"Gary Gygax, co-creator of the first role-playing game Dungeons and Dragons, has died at the age of 69. 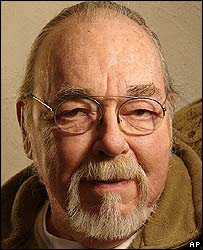 Gygax, who developed the game in 1974 with Dave Arneson, had been suffering from health problems for several years. Famous for its mythical creatures and odd-shaped dice, Dungeons and Dragons was an instant success that spawned a slew of video games, books and films. Gygax was also an author who wrote numerous fantasy books, including the Greyhawk series of adventure novels. He died on Tuesday at his home in Lake Geneva, Wisconsin, leaving a wife and six children. " For the last few days, I have been rewriting clubok's "Readable Books" module to work without 2da and tlk files. 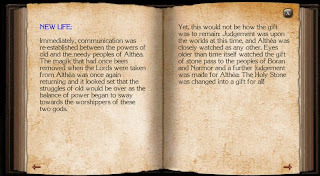 I loved the original concept, and having books look like books adds a lot to the atmosphere of the game in my opinion. It was always something I intended to do, and as I have reached the stage where I needed to define the wizard or sorcerer's spell book and cleric's holy book for when it comes to resting within the new era of the campaign, I made the leap to go ahead and do it. The end result, I believe, is a much easier process to manage , where all data is added or changed within one script within the module, rather than having to edit a tlk file and a 2da file, with confusing string resrefs and large tlk numbers. I have been able to maintain all the events that the original could do and even add one or two new elements of my own, including viewing pictures within a book. I am in the process of finishing off the PDF manual that explains how to add new books and update the text, and once that is complete, I will upload everything to the Vault and give a link from the menu on the left hand side. Furthermore, I will give some feedback on the building of the module that may be useful to others. For those familiar with clubok's version, you may notice I have made a difference that the contents conversation stays open all the while the book is being used. I personally found this easier to work with. Unfortunately, unforeseen events caused me to have to postpone this week's D&D adventure, which means the launch of Soul Shaker has been put back another week. It has been a long time coming since I first started working with it in October 2004, and so one more week should not make much difference. As it happened, the Internet appeared to be somewhat sluggish tonight, and so it may have hampered our gaming experience anyway. As the D&D adventure was postponed tonight, one of my players and I tried to play another CRPG. However, as that was hampered by the Internet problem, we then decided to try to use NWN2 for the first time over the Internet instead, using my Readable Books module as a test. At first, he kept being kicked out as he tried to join. Then, I quickly recalled something about a PWC file and after creating the file in the toolset and sending him a copy, we managed to connect fine. I was a little disappointed with the functionality of the DM Client, as even the movement felt a little jumpy rather than smooth. It was probably due to the fast movement that the DM has, but it still felt a little awkward to use. I also found the controls a lot harder to find and some of the basic stuff (like searching an inventory), I could not find at all! However, my use of the DM Client is a long way off yet, and so I hope many of these issues will be resolved by the time I come to use it, or I will have a better computer on which to run it, or I may just get used to using it in time.